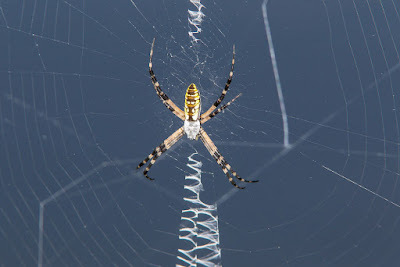 We're looking at the spider's stabilimentum, or stabilimenta if there are more than one. The stabilimentum is a rather decorative structure that many spiders build into the centre of their webs. They tend to look pretty darn snazzy! From lightning strikes and spirals of lightning to circular platforms made of pure lightning. Pure Lightning! Or silk. Maybe. Yeah, probably silk. Ribbons of soft, fluffy silk. 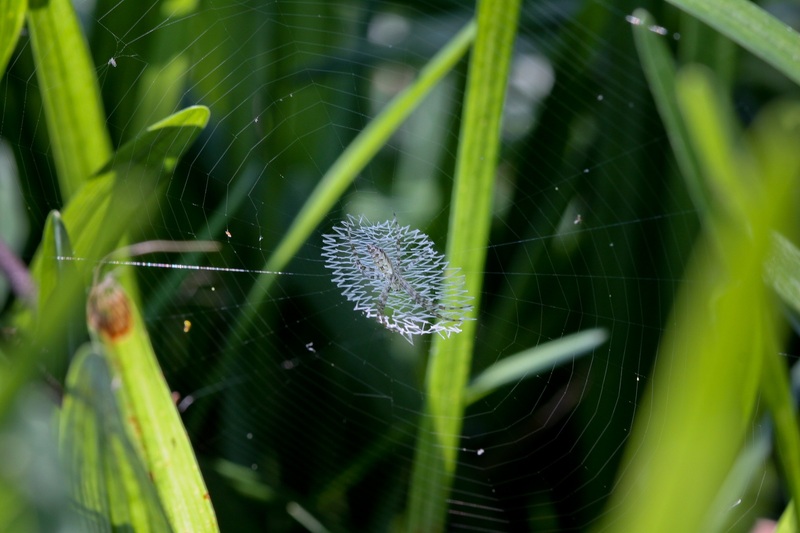 Though some spiders, not least those of the genus Cyclosa, will use corpses and detritus to gussy up their web. 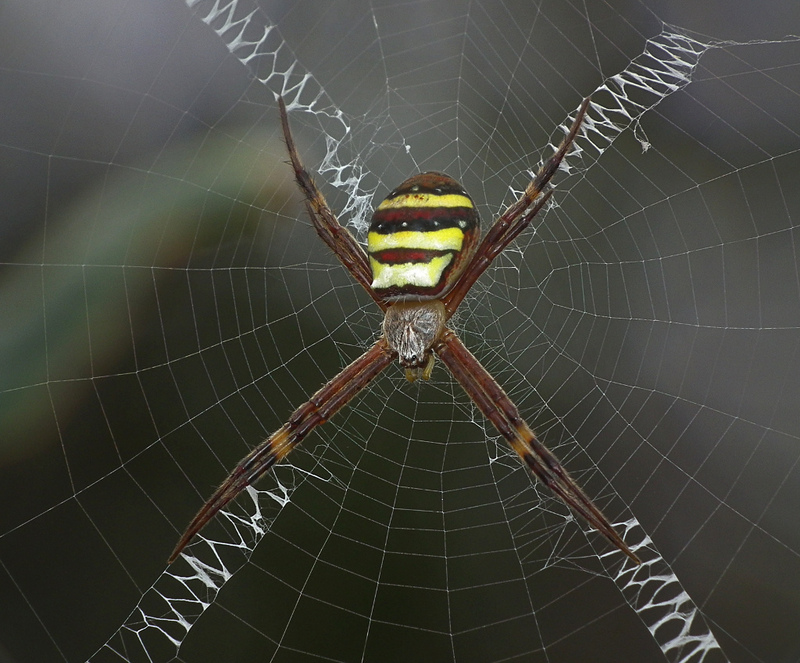 Where on earth would spiders be without their decorative corpses? Some kind of insect heaven, I guess. Where the spiders are herbivores and pesticide is sweet, sweet nectar. 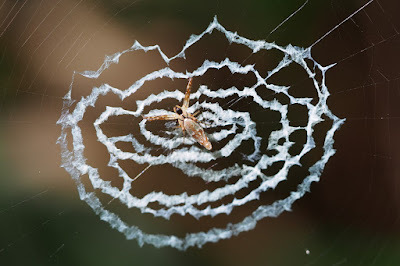 Some Cyclosa spiders even use spirals of silk to mercilessly draw the eye to their mound of death. It seems pretty morbid, but they probably see at as hard-hitting art unveiling the ultimate horror of life. That's how I imagine spiders. They probably smile while they do it, too. But what's it all for, these strange decorations? Apart from being an art installation, I mean. Truth is, no-one really knows! It is in fact, an area of hot debate. There are several possibilities, but we might need to ask the spiders to be sure. Unfortunately they're keeping silent on the issue and they have no pencils to write it down. And if they're writing it in silk right there in their webs then all we can say is that their handwriting is atrocious. As you can tell from the name, stabilimentum, it was initially thought that they provide extra stability to the web. It's a reasonable guess, many stabilimenta designs even look a lot like truss bridges. However, this particular hypothesis has been entirely dismissed. Partly because of all the spiders who don't build stabilimenta. But there are other possibilities, for example camouflage. 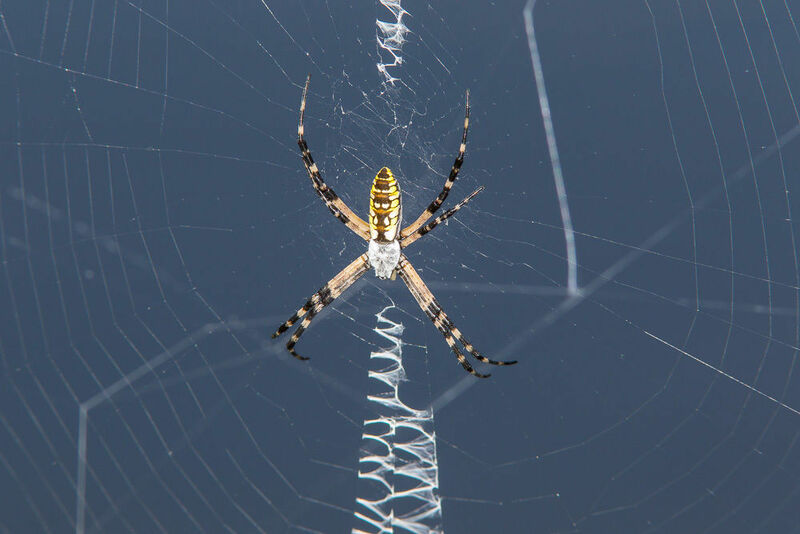 Shockingly enough, there are creatures out there who would happily eat a spider. And that's a problem for a spider who appears to be suspended in mid air. It's quite noticeable, you see. There aren't many places to hide in mid air. 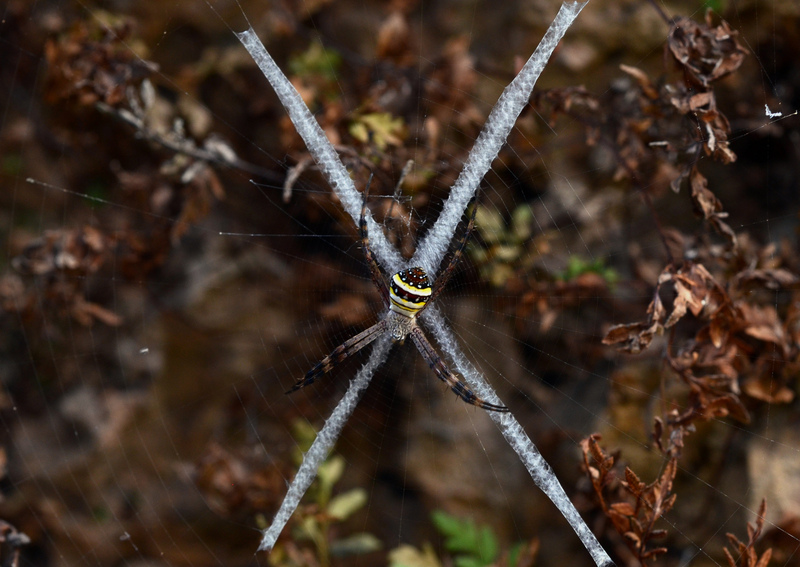 So perhaps standing on a stabilimentum in the middle of their web makes the actual spider more difficult to see. Another possibility is practically the complete opposite. 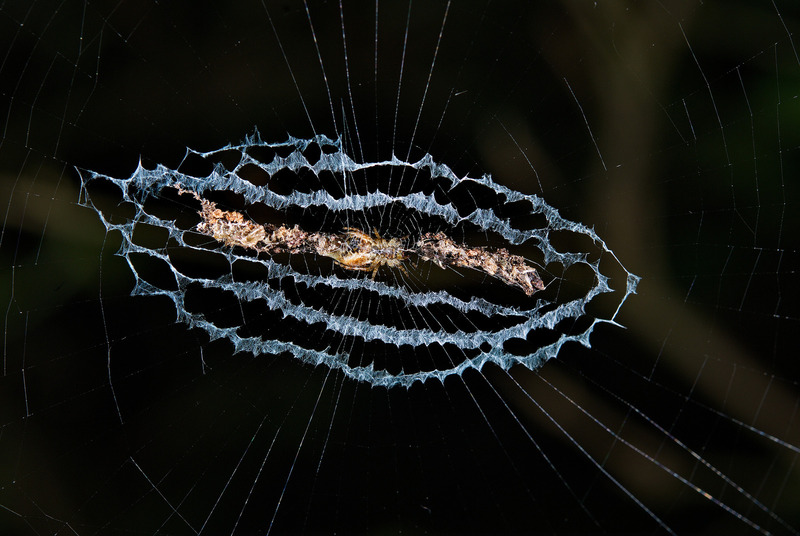 Spiders go to a whole lot of effort building their web. They'd rather not lose it to some galumphing oaf like an oblivious bird or other animal. So perhaps the stabilimentum serves as a kind of warning, a sign which means "beware the invisible object". Yet another possibility is practically the complete opposite... again. This time, it involves the curious fact that some stabilimenta reflect ultraviolet light. A lot of flowers do that, too, it's one of the ways they attract pollinating insects. So perhaps these stabilimenta attract prey? It's all very complicated! 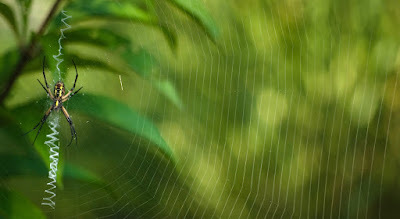 A big part of the difficulty is the fact that you can't be sure when a spider will even build a stabilimentum. 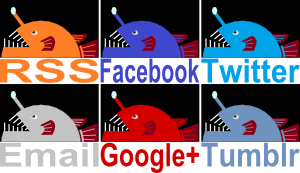 Some do, but then a closely related species doesn't. Even an individual spider might change the design of their decoration as they get older or even from day to day and web to web. One day it's a big X, the next day it's more like a big line and the next day maybe they won't build one at all! All of which makes it seem that there may well be more than one purpose for a stabilimentum. For example, perhaps they really do attract prey and a well-fed spider simply doesn't need one. At the same time, maybe 'warning' birds of the presence of a spider web is actually more like 'advertising' to birds the presence of a tasty spider. 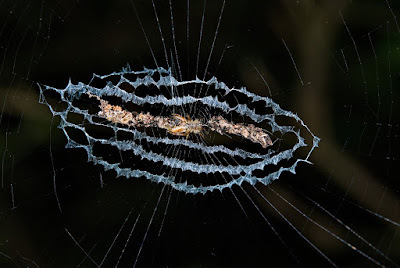 Or perhaps, it's the complete opposite, and decorations stop birds from flying into the web but at the same time reduce the number of insects that fly into it, too. 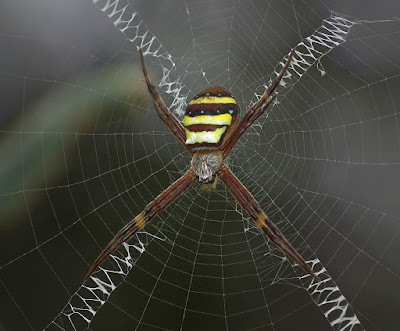 And then, of course, do all spiders who build a stabilimentum do so for the same reason? Maybe little spiders and big spiders do it for different reasons? Maybe different families use them for different purposes? I mean, Cyclosa spiders have a bunch of corpses in there! Can it really serve the same purpose as a zig-zaggy X? PHEW! 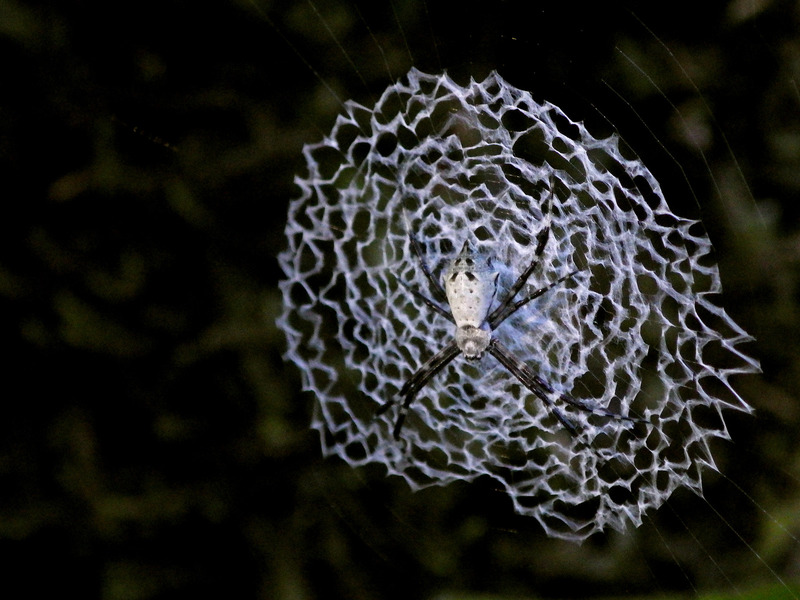 It's amazing to think that one of the prettiest and most conspicuous aspects of spider life remains so mysterious. I guess it shouldn't be so surprising that they have a few tricks up their sleeve. After all, they have a lot of sleeves. Or trouser legs. i love the argiopes. love their 'zippers'. Yeah, they're some of the most impressive ones for sure! It's a double-whammy! 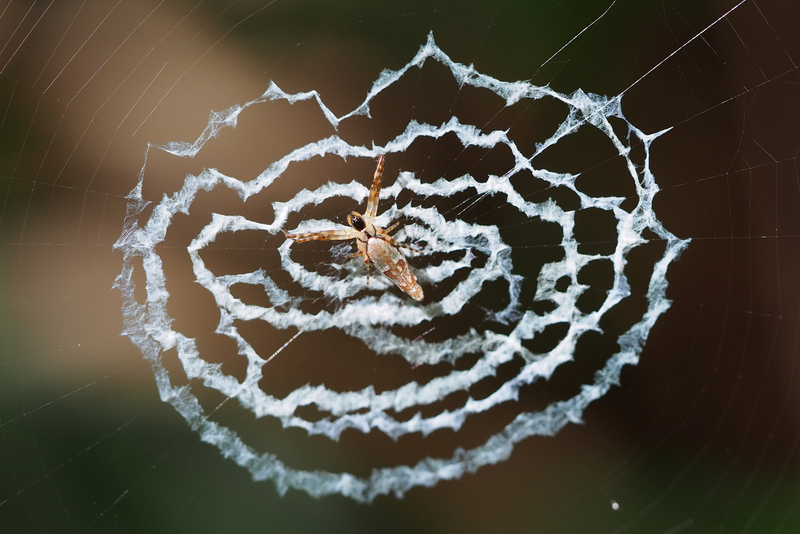 It warns you of the web and it's pretty enough to stop you destroying it.